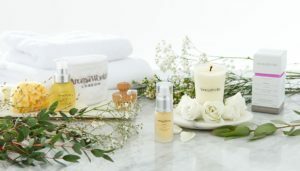 Luxury Facial – 70min – skin analysis, cleanse, steam, extraction, exfoliate, treatment mask, full facial massage, tone, moisturise eye serum, and lip balm, head and scalp massage. Remove make-up and jewellery prior to appointment. We recommend clients use the restroom before the session. We will analyse your skin and choose the best products to suit your individual skin type. Clients will be taken through a quick consultation before the treatment is carried out. The room will be darkened but with a small amount of light for skin analysis, clients may request to have the lights on but we recommend a very dim lit room for maximum relaxation. Clients may request a completely silent treatment throughout their massage, although relaxing music is provided. Modesty is kept at all times, clients may wish to remove their top halves fully for comfort but not necessary as long as the chest/décolletage area is exposed for the treatment. Clients are given a short rest period after treatment. It is highly recommended to rest and drink plenty of water. No make-up for at least 12hrs after your treatment. No further facial treatments for 48hrs. Avoid direct sunlight and heat treatments for 24hrs. Double cleanse, tone and moisturise twice daily with products that are recommended for your skin type. Exfoliate the skin and use a treatment mask twice a week using products that are recommended for your skin type. Dress comfy and simple avoid wearing your best clothes as excess oil may get on clothing from the massage. Avoid heavy meals just before a massage as a side effect of a massage can be nausea. We recommend clients use the restroom before the session as excess fluid will be flushed around the body from a massage as well as the treatments lasting up to 1hour 15 minutes. First time clients will be taken through a quick consultation before the treatment is carried out. 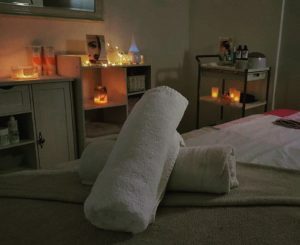 The room will be darkened but with a small amount of light for relaxation, clients may request to have the lights on but we recommend a very dim lit room for maximum relaxation. Modesty is kept at all times, underwear is usually kept on but clients may wish to remove their bras and/or underwear. Clients are given a 15 minute rest period after treatment. It is highly recommended to rest and drink plenty of water to re-hydrate. Our non-oily, quick drying and Paraben, PEG-free products work to achieve a flawless, refined finish that leaves the skin feeling soft, smooth and intensely hydrated. As your skin sheds, Morocan tan fades naturally between 5-7 days after application. Development time from 30minutes for a natural glow and up to 8 hours for a deeper tan. Shave/Wax 24 hours before your tan. Exfoliate & wash your body 12 hours before your tan – Don’t forget your FREE primer sachet before your appointment! Do NOT apply moisturisers, deodorants, oil based products or perfumes before your appointment. Please bring loose, dark clothing & open toed shoes to wear after your tan. We do provide tanning thongs but you may wear your own underwear or swimwear if you wish (dark colours are advised). Moroccan Tan is quick drying and you will be dry to dress after your tan, but try to avoid touch the skin after application (tanned palms aren’t a good look!). After your suggested time of development shower off your tan. Use gentle soaps to rinse off the development colour to reveal your beautiful natural glow. Pat your body dry after showering. Apply moisturisers to your skin regularly to prolong the tan – Don’t forget your FREE after tan moisturiser to prolong your tan. Get your full body tan for £20 EVERY Wednesday! Waxing is quick and easy, great for removing large amounts of hair and gives better and longer lasting results than hair removal creams or shaving. 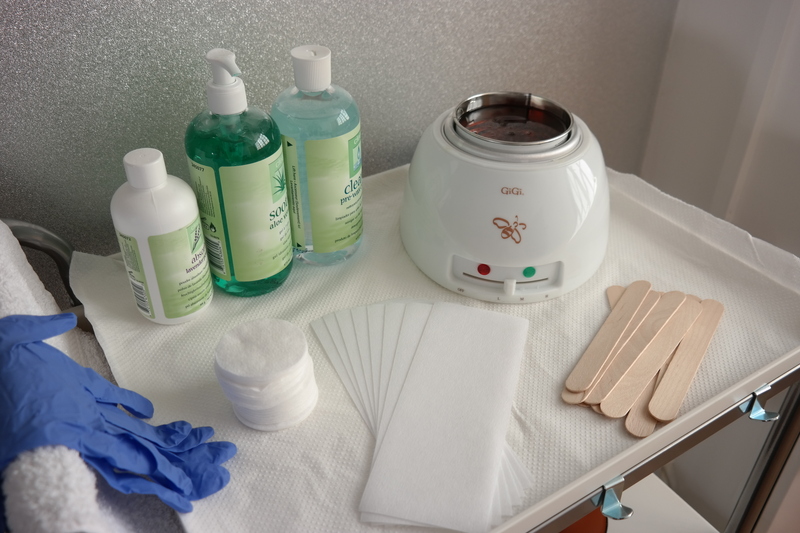 In our salon we use ‘Depliveve’ warm wax & paper strip method for face & body waxing. Try to avoid the use of body oils and creams the day of your waxing session. After waxing services your skin may redden, this is called erythema and will usually fade within a few hours. It is recommended that no make-up, perfumes or moisturisers are applied to the waxed areas for 12-24 hours. Heat treatments (sun beds, exposure to the sun) or hot showers is also not recommended 12/24 hours after waxing treatments. Threading is when a thin cotton thread is doubled, then twisted & then rolled over areas of unwanted hair, plucking the hair from the follicle. It is recommended for those who are unable to have waxing, or have sensitive skin. After threading services your skin may redden, this is called erythema and will usually fade within a few hours. It is recommended that no make-up, perfumes or moisturisers are applied to the threaded areas for 12-24 hours. Heat treatments (sun beds, exposure to the sun) or hot showers is also not recommended 12/24 hours after threading treatments. 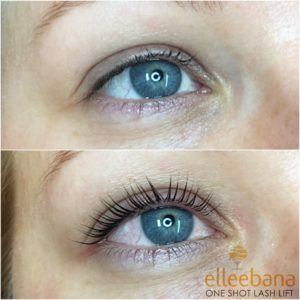 Lashbase individual eyelash extensions are semi permanent and can last up to 4+ weeks, depending on your natural lash growth cycle. To keep your lashes at their very best, we recommend infill maintenance every 2-3 weeks. 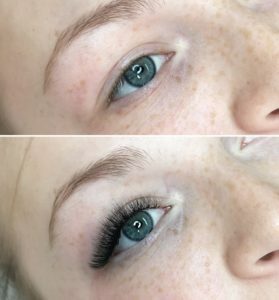 With expert application by a trained technician and by avoiding the use of oil-based eye products, these eyelash extensions behave just like natural lashes and achieve a thicker, fuller and more flattering look. Please ensure you have see one of our Lash technicians for a consultation & a patch test minimum 24hrs prior to appointment. No make-up or oil based products (drops, creams ect) applied to or around the eye area. Contact lenses are removed (please bring glasses with you for after your treatment). Wear comfortable attire to relax in. Eye pads will be applied under your eyes & over your bottom lashes. Your eyes will be closed throughout the service. Synthetic lashes are carefully attached to each individual natural lash using a medical grade adhesive. Clients may request a completely silent treatment through their service, although relaxing music is provided. Do not pull or pick your lashes off or out-please contact the salon for a safe & quick removal. Avoid oil based make up removers & removing any eye make up with cotton wool. Cleanse your extensions with water or an oil free cleanser & cleansing brush, lash base purified foam cleanser is highly recommended. Carefully dry your lashes on a towel or soft cloth after showering/washing face and brush afterwards. Lash extensions cannot be permed or tinted, please let us know if you require a tinting service prior to application. Carefully groom your lashes with a small spoolie/mascara wand (provided after your service). Please ensure you have see one of our technicians/therapists for a patch test at least 24hrs prior to appointment. Your technician/therapist will asses your lashes and determine the correct curl for your desired look. Silicone rods are applied to the eyelids and the top natural lashes are adhered to the rod ready to be set. Perming solution is applied to the natural lashes, then a setting solution. Tint is applied after as an optional and recommended add on treatment. Avoid getting your lashes wet within the first 24 hours after. Avoid saunas, steam and sun beds for the first 24 hours. Sleep on your back for the first night after this service. Recommended: Elleeplex application nightly to keep your lashes nourished and promote healthy growth. 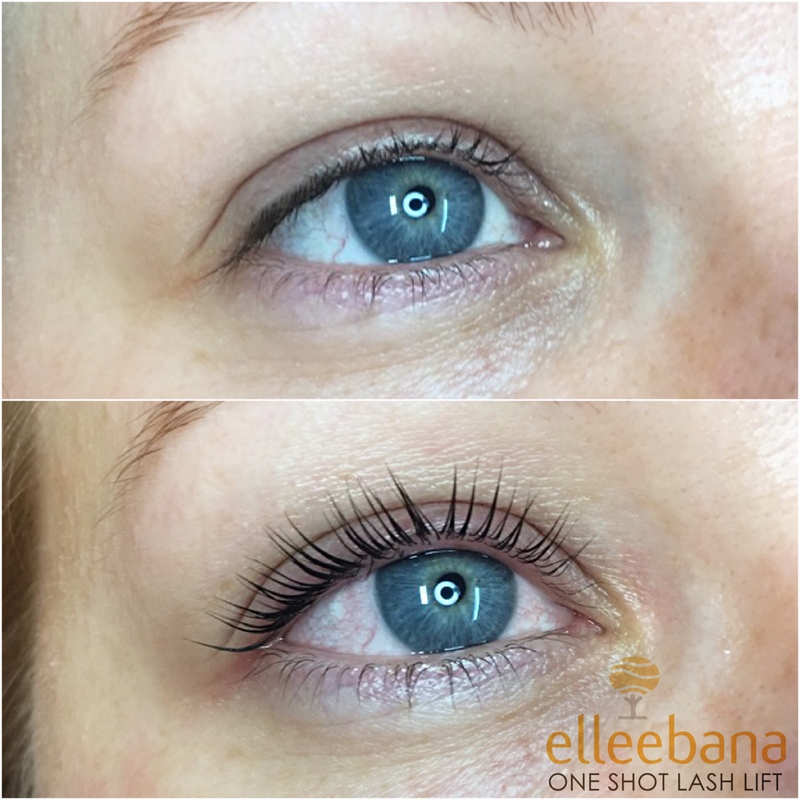 *NEW* Lash Dose – available in Alton – recommended for weaker lashes or those looking to gain a little extra wear from their lash lift treatment. Tinting is a semi-permanent method to dye the hair on your lashes and/or eyebrows. Eyelash tinting can be used to create a look of dark eyelashes without using mascara, available in light/dark brown, black or blueblack (perfect for blue eyes). Eyebrow tinting can be used to create a more defined look of eyebrows without the use of brow pencils or make-up, and is available in light brown, dark brown or black.